Salvatore’s practice has focused on motor vehicle, products liability and wrongful death cases, acting exclusively on behalf of injured people and their family members. Salvatore is a partner at McLeish Orlando LLP. He was called to the bar in 2000. For the last two decades, Salvatore has dedicated his practice exclusively to motor vehicle personal injury, products liability and wrongful death cases, acting on behalf of injured people and their family members. Since 2016, Salvatore has had the honour of having been consistently selected by his peers for inclusion in the Best Lawyers® in Canada publication in the field of personal injury litigation. As a trauma lawyer, Salvatore handles a complex, serious personal injury cases on behalf of accident victims and their families. He practices all over Ontario and has represented clients from around the country. He also represents Canadians who have been injured in jurisdictions outside of Ontario. 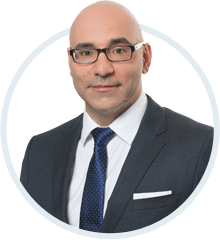 Salvatore regularly appears as counsel before various levels of Ontario courts, the Financial Services Commission of Ontario, the Workplace Safety and Insurance Appeals Tribunal and the CPP Review Tribunal. He lectures and publishes extensively on trial advocacy and all matters related to actions for personal injury and wrongful death. He is a frequent speaker at various continuing legal education programs, including those of the Law Society of Upper Canada, the Ontario Trial Lawyers Association, the Canadian Institute and the Advocates Society. He is involved in various legal associations. He is a member of the Association of Trial Lawyers of America, the Ontario Bar Association, the Ontario Trial Lawyers’ Association, The Canadian Bar Association and the Advocates’ Society. He is a former member of Council of The Medico-Legal Society of Toronto (2015 to 2018). Salvatore is also a former board member (2017) and kayaking instructor at Abilities in Motion, a non-profit organization that promotes and encourages inclusive paddle sports for people with disabilities. When not at work, Salvatore enjoys spending time with his wife, Anne, and their three children. He also enjoys playing hockey and outdoors adventure sports. Blog: I was at fault, but injured – do I have any remedies?